I'm rarely, if ever, speechless. 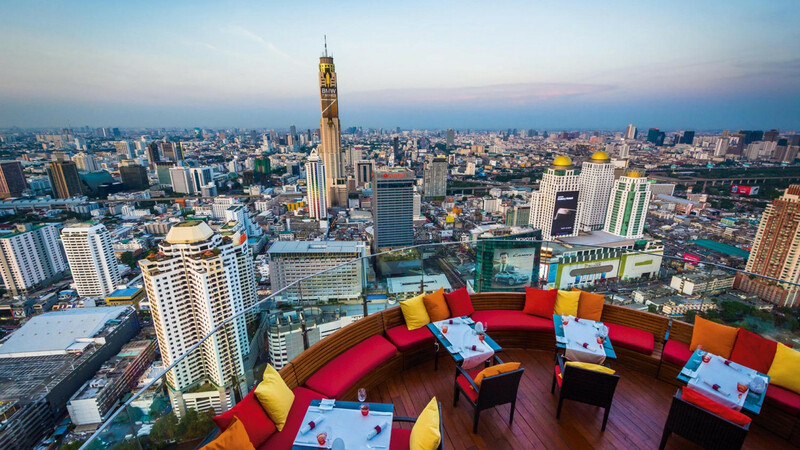 But as I stand on the 49th floor, 360-degree rooftop bar Octave, on top of the Marriott hotel on the corner of Sukhumvit Soi 57, it's the closest I've come in years. Leaning against the glass railing, I dip in and out of conversations with travellers of all kinds – a long-haired actor from London, a sunburnt holidaymaker from Wales on his way to Phuket, and the Anglo-Thai contingent that I'm with, but I can only half-listen. Bangkok's skyline stretches and yawns out before me, the towers of the financial district to one side, countless blocks of crumbling apartment complexes to the other, and the arrow-straight Sukhumvit road slices the cityscape in two. I'm from a city of eight million people, but there's a sense that the pure scale of this city, in all its hulking glory, is almost too huge to actually fully comprehend. But that doesn't mean I don't intend to try. I'm here for two brief stop-offs before and after a trip to the south of the country, with a total of an evening, a day and a night to spend here before and after flights. There are Bangkok residents among us, as well as seasoned travellers to Thailand's capital that hail from other parts of the country. There are also a couple of farang (foreigners) – one who came here some years ago on a backpacking trip, and me. It's my first time in Bangkok, and as soon as I touch down at Suvarnabhumi Airport in the close, late-winter air and we get onto the highway, I feel like I want to drink it all in. We arrive just before the sun sets, and on a taxi ride that bisects the city on the way to a hotel near its other major airport, Don Muang, I watch through swarms of brake lights as the day turns to night, and concrete grey turns to circuitboard neon. Our first port of call after check-in, of course, is a mall. 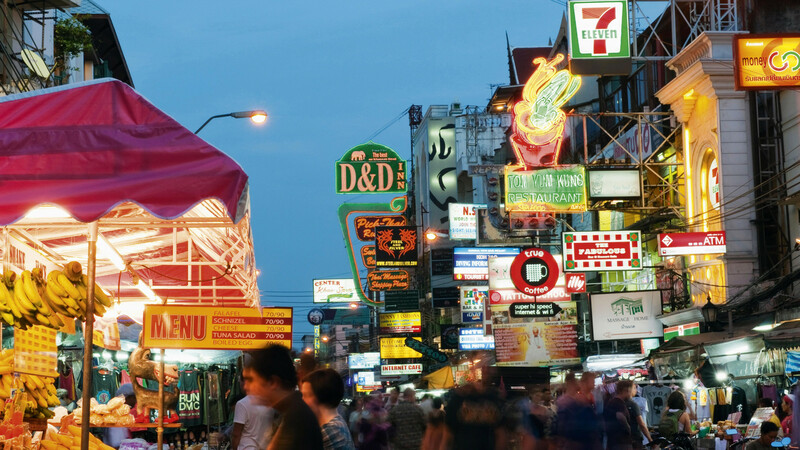 Bangkok is famous for them; places not just to shop, but to while away lunch hours and weekend afternoons. Dinner tonight is at Took Lae Dee, a quick-and-easy but excellent restaurant beyond the shelves of supermarket Foodland. I eat a delicious pad grapow gai – stir-fried minced chicken with holy basil – that epitomises the restaurant's name, which translates to 'cheap and good'. It costs the equivalent of about £1.50. Bamboo massage parlour and spa, and there's the cries of the working girls of Soi Cowboy, just around the back of my hotel. As before, a mall is the first pit-stop. At the hulking Terminal 21, we window-shop in western high-street clothing stores, before loading up a card with around five pounds' worth of credit and grazing on pork broth, noodles and mango sticky rice from the stalls in its food court. Next, it's time for some relaxation: the Bamboo Spa on Sukhumvit Soi 26 is the type you book in advance, vouched for by its regular visitors, and where massages are just massages. It's a beautiful, serene place. For the equivalent of about £25 I get a good hour and a half, starting with a comprehensive foot massage downstairs, with the main event a rigorous session by a masseur who clearly knows his way around a sore back or a tight hamstring. Newly restored, I take a walk down Soi Cowboy on the way back from my hotel – past inevitable calls of "Hello, handsome man!" from working girls – but it's largely quiet here, and I'm told it won't liven up until later. I spend a bit of the afternoon with headphones in, up and down quadranted blocks around Sukhumvit, watching vertical malls collide with lowly street markets. We're here in winter, so the sun is going down by 6pm or so. I meet my friend Richard at the front of my hotel for a couple of drinks at his before dinner. With English and Thai parentage, he speaks with an English accent but is just about fluent in Thai, and throughout the trip is nothing but effusive about his other home country – its sights, its food, its people and its culture. "Can you feel the buzz of the city?" he asks me, all Cheshire Cat smile through the dusky light. Work brings him to Thailand for business, pleasure or both as many times a year as he can justify. "Bangkok's great in the daytime, but at night it totally changes," he says, slapping his thighs with the pure excitement of being here. "It really comes alive after dark." He confirms what I suspect, even as a first-timer: the thrill of Thailand, particularly its pulsating capital, just doesn't get old. We hail a tuk-tuk and jump on, ducking and weaving through traffic to his hotel as twilight turns to darkness. It's a Marriott, and a palatial one at that, although – in relative terms – a hotel like this is affordable here. We head up to a beautiful roof-terrace bar perched half-way up the enormous tower. It's a sublime, ridiculous place for a pre-dinner drink, and before we know it we're back down in the lobby hailing cabs to Teppen, on Soi 67, which I'm told is one of the best Japanese restaurants in the city. We're on a table of at least 25, which includes the entire group I've travelled here with, a huge group of their extended family and friends, plus a seemingly rotating line-up of guests spread between London and Bangkok. After a breathless feast of sashimi, Japanese barbecue and lots of sake, we're whisked back in yet another taxi and up a lift to Octave's 49th floor, where I have my heart-stopping moment. After Octave, it's back down to the ground-floor Havana Social Club, where we get in via a password at a payphone (no, speakeasies aren't solely confined to basements in New York and London) and drink rum cocktails in a bar made up to resemble the Cuban capital in the 1970s. And after that, it's on to Sing Sing, a pulsing nightclub designed to look like a colonial drinking den in Victorian Hong Kong, where the DJs spin funky house and the bar doesn't close until the sun comes up. The cocktails, sake, and Johnnie Walker and soda take hold, we dance as the time flies, and soon it's 3am and time for the last taxi of the night. Maybe it's due to its location in the heart of Thailand – the place everyone flies to on their way to Chiang Mai in the north, or Phuket and the islands in the south. Or perhaps it's because it's a true melting pot – a city of hundreds of languages and cultures, of business and of partying and everything in between. But my resounding memory of Bangkok is that it feels like a city shot in time-lapse; faster, more frenetic, more electric than any I've been to before; where you can live a week in 24 hours. 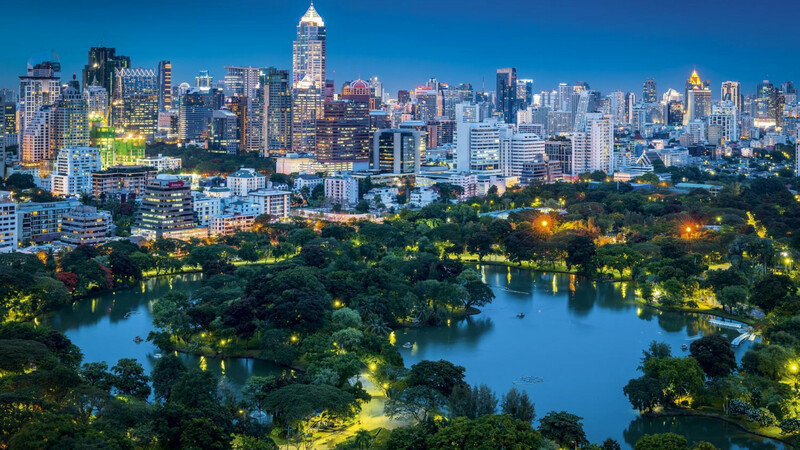 Thai Airways offers direct flights from London Heathrow to Bangkok, starting at £612 return. 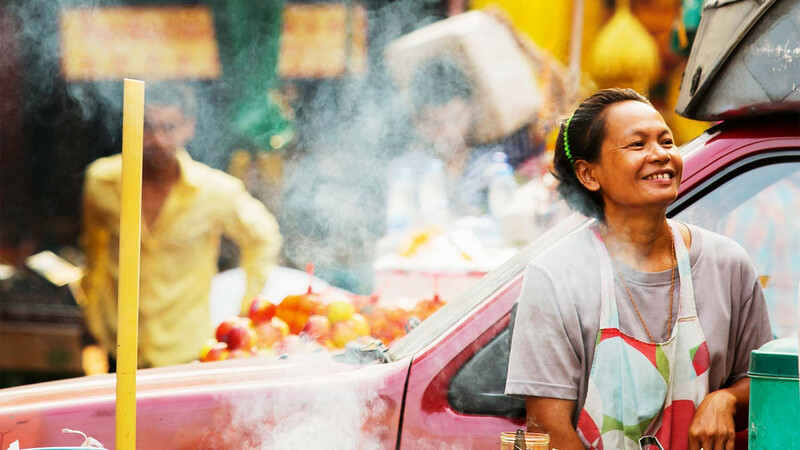 Royal Jordanian fly from London Heathrow to Bangkok with a stop-off in Amman, Jordan, starting at £482 return. Through all of the abounding energy, though, the single moment that I'll remember more than any other is on the top of Octave, where I surveyed the skyline and time, for a brief moment, stood still. It is, as I said, a place that's full of contradictions, and a day and a night here leads me to believe that, although the city seems to move faster than you can possibly imagine, in Bangkok it feels like you're always in the here and now. Want to discover a quieter side to Thailand for yourself? Enter our competition to win a tour with G Adventures, the small-group tour specialist.